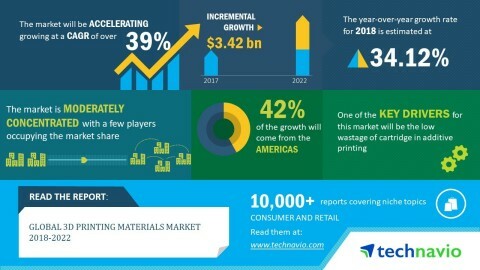 LONDON — (BUSINESS WIRE) — December 28, 2018 — Technavio analysts forecast the global 3D printing materials market to grow at a CAGR of over 39% during the forecast period, according to their latest market research report. Additive printing generates lower wastage due to the predetermination of the exact amount of materials required. Additive printing mitigates the waste generated by computerized numerical control (CNC) milling, which creates a rough shape initially to print the desired dimensions. 3D printing is an ideal solution to print products with detailed definitions as it can print fine details accurately. It also allows users to obtain the exact designs according to the requirement. Hence, the use of 3D printing reduces the volume of waste. The low wastage of cartridge in additive printing will drive the growth of the global 3D printing materials market during the forecast period. The global 3D printing materials market research report provides market segmentation by type of material (thermoplastic polymer, photopolymer, metal powder, others), and by region (the Americas, EMEA, and APAC). It provides an in-depth analysis of the prominent factors influencing the market, including drivers, opportunities, trends, and industry-specific challenges. The Americas held the largest share of the market in 2017, followed by the EMEA and APAC respectively. Although APAC held the smallest share of the market, it is expected to witness the maximum increase in its market share over the forecast period followed by the EMEA region.